The difference between vinyl and fabrics can be likened to the contrast between matte and glossy finish in print. While captivating, shiny, and vibrant, a matte finish imparts elegance, refinement, and subtlety. Adhesive Vinyl – With banners, vinyl vs fabric may be the best way to go when sharp photographic images are displayed, while fabric might be the direction needed for a series of hanging banners designed to have texture and give. Fortunately for sign professionals, both vinyl and fabric remain in vogue, with demonstrated needs in a range of markets. 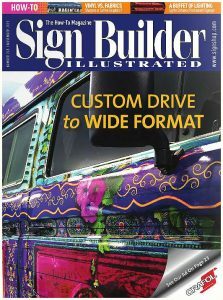 Pixus Digital Printing, based in Lafayette, Louisiana, has about 500 business customers across the U.S.including casinos, construction, restaurants, retail stores, ad agencies, and more. Specializing on everything from banners and signs to adhesive graphics, POP displays, and murals. Pixus works with six large-format printers, two ten-foot MultiCam Digital Express finishers, and high-speed wide-format routing systems. About a third of their business is banners with a strong emphasis on vinyl and printed substrates. Company projects continuously highlight a diverse market’s need for vinyl vs fabric. One project demonstrates the aesthetic and practical purposes for large banners. The University of Louisiana-Lafayette football team was looking to demark a private area for practice during outdoor workouts. To help them achieve this, Pixus printed a polyester mesh banner spanning over two-hundred feet and eight feet tall using one of it’s latex printers. The project was printed in fifty-foot sections and joined by hidden seams. The presentation and installation for vinyl banners include grommets for hanging, stretched framed banners, which can create a tight framed banner using a snap open frame system, and a mesh screen banner, a polyester material which provides a solution for windy locations. 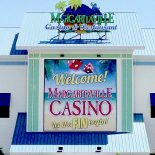 Meanwhile Margaritaville Casino in Bossier City, Louisiana, requested a sign that would top the entrance for the grand opening. To create this look, Pixus printed on two 15-by-30-foot banners and joined them to make one. The banner was printed using high-resolution with a six-color process and installed with the use of a snap frame unit, which creates a flat-sign appearance. When it comes to vinyl ‘dos’ and ‘donts’, Pixus has a few tips. with proper care. After finishing the banner for hanging, ensure it has the correct number of grommets installed. 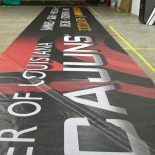 Always have finished the outside edges of your banner. And finally, roll the banner around the outside of a tube when storing to avoid creasing and flattening.